Born: 10 January 1780, Hamburg, Germany. Died: 3 September 1857, Baltic sea. Hinrich (or Heinrich) Lichtenstein, German physician and naturalist, completed his schooling at the famous Johanneum High School in Hamburg, where his father was headmaster, and went on to study medicine at the Universities of Goettingen and Jena. 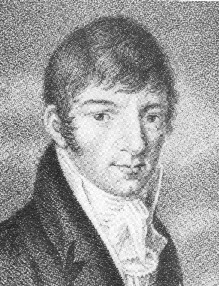 He graduated as Doctor of Medicine (MD) in April 1802 at the University of Helmstedt (which was closed in 1810), where his father was by then Professor of Theology. At that time General J.W. Janssens, who had just been appointed the first governor of the Cape Colony after its restoration to the Dutch, was looking for a family physician and a German tutor for his son to accompany him to the Cape of Good Hope. Lichtenstein, keen to learn more about this distant land, filled both positions. Before departing he spent a few days with the botanist and insect collector Count van Hoffmannsegg and his staff at Brunswick to acquaint himself with the procedure for collecting and preserving natural history specimens. He arrived at the Cape with the Janssens family in December 1802 and set about collecting information for a comprehensive account of the colony, including its geography, natural history, politics, ethnography and history. Lichtenstein remained in South Africa for just over three years and undertook several journeys into the interior. In addition to his own observations he had access also to the journals kept by General Janssens and Commissary-General Jacob de Mist. In October 1803 he set out with de Mist and a large party on a six months tour of the colony. They first travelled north to Saldanha Bay and the mouth of the Berg River, then eastwards round the Piketberg, through Piekenierskloof to the Olifants River valley, passed north of present Calvinia, through the Roggeveld, and on to Roodezand (now Tulbach) on 20 November. Near Calvinia he saw the impressions of what he described as "eel fish" in the sedimentary rock, but these were probably trace fossils - markings left by living organisms rather than the organisms themselves. From Tulbagh they set off for the eastern frontier. During several days at Swellendam he collected plants and insects in the Duiwelsbosch forests, as well as seeds for the Cape Town botanic garden. Continuing along the coast to Knysna the party crossed the mountains where Prince Alfred Pass is now and travelled down the Langkloof, reaching Algoa Bay on 7 January 1804. They then proceeded north-eastwards to the Fish River and after failing to meet Chief Gaika returned through the Karoo and the Hex River Pass to Cape Town, which they reached on 23 May. Lichtenstein collected many natural history specimens during the 3000 km trip, and made detailed notes on the colonial mode of life. During the following winter he collected plants and insects near Cape Town in his spare time, often accompanied by the pharmacist Peter H. Polemann*. In September 1804 he travelled to Swellendam and surrounding areas, where he took the opportunity to visit J.A. Auge*, who was by then blind and 93 years of age. By that time he had been appointed also as surgeon major to the Hottentot Light Infantry batallion and during the summer of 1804-1805 was involved in combating a deadly epidemic of dysentery among the Dutch troops. He described the epidemic in a paper in Hufelands Neues Journal der praktischen Arzneykunde in 1808, including its successful treatment with Calomel, a compound of mercury used earlier in India. In 1805 Lichtenstein was requested to accompany an expedition led by H. de Graaff, landdrost of Tulbach, to conclude peace with the Bushmen, gain information about the Hottentots along the Orange River, and visit the country of the Bechuanas further north. His duties included observations of the natural history and native inhabitants. Departing from Tulbagh on 7 May 1805 the expedition crossed the Orange River at present Prieska. Accompanied by a local missionary they followed the route taken in 1801-1802 by P.J. Truter* and Dr W. Somerville* to the vicinity of present Kuruman, where they were well received by the Bechuana chief. Somewhere north of Prieska he discovered the mineral crocidolite (blue asbestos). It was described by the German chemist M.H. Klaproth, to whom Lichtenstein sent various mineral specimens. On the return journey he made an interesting collection of barbel, Clarius gariepinus, from a spring between present Carnarvon and Fraserburg. As the spring was not connected to any river the fish may have represented a relic population from a wetter climatic period. The species has not been collected so far south of the Orange River in later times. The return journey brought them back to Tulbagh early in August. This journey was the first during which he made astronomical observations to help determine his position. Having encountered cases of smallpox on the border of the colony, he was ordered by the governor to return to the area and innoculate the inhabitants against the disease. He left Tulbach on 19 August, travelled to the Roggeveld and across the Ceres Karoo nearly to present Sutherland, returning to Tulbach on 9 September having travelled some 600 km and innoculated almost 300 persons. His observations on the outbreak and a detailed account of the steps taken by the authorities to prevent the spread of smallpox were described in a further paper in Hufelands Neues Journal der praktischen Arzneykunde in 1809. Following the arrival of a large English fleet in January 1806 to take over the Cape, Lichtenstein returned to Europe in March with General Janssens party, having arranged and classified his collections before departure. After spending four months in Holland he returned to Germany in October 1806. He entrusted his collection of plants to Count J.C. van Hoffmannsegg and his insects to the entomologist J.C.W. Illiger of Brunswick, who thought that about half of his more than 600 species were new to science. In 1807 Lichtenstein wrote an article in the Algemeine Geographische Ephemiriden dealing with the Bechuana, in which he tried to present a more accurate and balanced description of these people than that published earlier by John Barrow* in the same journal. This was followed the next year by a paper in the Allgemeines Archiv fuer Ethnographie und Linguistik... in which he gave an account of the different indigenous languages that he had encountered in South Africa. In 1810 he published an article on the early history of the Cape, "Die Geschichte der Entdeckung des Vorgebirges der guten Hoffnumg" in the Hamburg periodical Vaterlaendisches Museum. It was the first attempt to describe the discovery of southern Africa by explorers from outside the continent and was based on most sources available at the time. Meanwhile he had been compiling a larger work, Reisen im suedlichen Afrika in den Jahren 1803, 1804, 1805 und 1806, which was published in two volumes in 1811-1812. An English translation, Travels in southern Africa in the years 1803, 1804, 1805 and 1806 appeared in 1812-1815 and was reprinted by the Van Riebeeck Society in 1928-1930. However, the translation has been described as unreliable (Hoge, 1946). Dutch and French translations were also published. The book is an unpretentious, objective and valuable description of the colony and its inhabitants on the eve of the final British occupation. It includes a map of the colony based on all available material and his own observations. The languages of the Korannas and Bechuanas are dealt with in two appendices. Late in 1810 Lichtenstein began lecturing on zoology at the newly established University of Berlin, where Illiger was professor of Zoology. The university awarded him the honorary degree Doctor of Philosophy and, though he had no formal qualifications in zoology, appointed him as professor of natural history. In 1812 he became temporary director of the university's botanic gardens and when Illiger died the next year he also took over the administration of the Zoological Museum. He was an able administrator and was appointed curator of the Zoological Museum in August 1815. Two years later he became a member of the Berlin Akademie der Wissenschaften. Though not considered an outstanding success as an academic he none the less published over 30 papers. These included an original account of the history of the ostrich, "Beitrag zur Naturgeschichte des Strausses" (1811), and a detailed account of species of antelopes, most from Africa (1814). Among others he described and named the Impala. In 1823 he published a catalogue of duplicate specimens in the Zoological Museum, Verzeichnis der doubletten des Zoologischen museums der Koeniglichen universitaet zu Berlin..., which included descriptions of new mammals, birds, amphibians and fish. His descriptions of some species of fish from the Cape led Dr J.L.B. Smith (1962) to recommend that the names he gave to two new species should be officially recognised. Later he published Darstellung neuer oder wenig bekannter Saeugethiere... (Berlin, 1827-1834), which included plates and descriptions of some South African antelopes. Other papers relating to Africa were "Ueber die Afrikanischen und Asiatischen Arten der Gattung Sorex" (on African and Asian shrews, 1829), and "Ueber Lutra maculicollis, Lichtenst., aus dem Kafferlande" (on a new species of otter, 1835). In his later years he published a monograph (in Latin) on a new system of avian nomenclature applied to the zoological collections of the University of Berlin (1854), and a similar work on the nomenclature of its reptiles and amphibians (1856). Earlier he had been instrumental in having J.L.L. Mund* and L. Maire* sent out to collect plants in South Africa and had obtained the support of the German government for the collecting activities of G.L.E. Krebs*. In 1844 the Berlin Zoological Garden was established under his direction. In June 1815 Lichtenstein married Victoria Hotho, the well-educated daughter of a wealthy Berlin industrialist, which enabled him to travel all over Europe. They eventually had three children. Both were members of the Berlin Choral Academy and their apartment became a meeting place for music lovers. The composer Carl Maria von Weber was among their friends. In 1816 Lichtenstein was elected a member of the exclusive Monday Club, consisting of just 30 persons from the upper intelligensia. He died after a stroke on board a ship in the Baltic Sea, on his way back to Germany from Sweden. He was small in stature but of robust build, not attractive in appearance but posessing great charm, versatile and full of enthusiasm. His documents and papers are housed in the Staatsbibliothek in Berlin, while most of his correspondence is in the Institut fuer spezielle Zoologie and in the Zoologisches Museum of Humbolt University, Berlin. There are also several collections of his letters in various other German archives and libraries. Lichtenstein was the first naturalist of note to penetrate beyond the Orange River and his wide interests and zest for collecting rivalled those of C.P. Thunberg* and Anders Sparrman*. On his main journeys he travelled fully equipped with his books, instruments and facilities for preserving specimens. He was commemorated in the plant genus Lichtensteinia (Fam. Umbelliferae), and in the species Gazania lichtensteinii, Anthospermum lichtensteinii, and Barleria lichtensteiniana. Bauer, A.M. Early German herpetological observations and explorations in southern Africa, with special reference to the Zoological Museum of Berlin. Bonner zoologische Beitr?ge, 2003, Vol. 52, pp. 193-214. Laidler, P.W. & Gelfand, M. South Africa, its medical history, 1652-1898 (pp. 95, 102 note 79). Cape Town: Struik, 1971. Lichtenstein, H. Travels in southern Africa in the years 1803, 1804, 1805 and 1806 (translated by Anne Plumtree). London: Colburn, 1812-1815. Reprinted Cape Town: Van Riebeeck Society, Vol. 10 and 11, 1928-1930. MacRae, C. Life etched in stone: Fossils of South Africa (p. 3). Johannesburg: Geological Society of South Africam 1999. Sandler, E.M. Lichtenstein's vaccination tour - 1805: Introduction and extracts. South African Medical Journal, Supplement, 20 April 1974, pp. 1-15. Skelton, P.H. & Skead, C.J. Early reports and paintings of freshwater fishes in the Cape Province. Africana Notes and News, 1984, Vol. 26(1), pp. 29-35. Smith, J.L.B. Fishes from the Cape described by Lichtenstein in 1823. South African Journal of Science, 1962, Vol. 58, pp. 39-40. Spohr, O.H. Historical perspective: M.C.H. Lichtenstein. Bokmakierie, 1978, Vol. 30, pp. 22-24. Wilson, M.G.C. & Anhaeusser, C.R. (eds). The mineral resources of South Africa (p. 68). Pretoria: Council for Geoscience, Handbook 16, 1998.